Access – Convenient accessibility to Highway 400 in Alpharetta. Nearby services include restaurants, hospitality, banking and general retail. Designed for Smaller Tenants – Hembree Center was developed specifically for small to medium sized tenants. Units range in size from approximately 1,000 to 1,600 sq. ft. Each unit includes an office, restroom and loft / warehouse space. Flexibility to Grow – Tenants at Hembree Center can lease units beginning at only 1,000 sq. ft. in size. Units can be inexpensively combined to accommodate tenant growth without having to relocate. Service providers in the various fields. 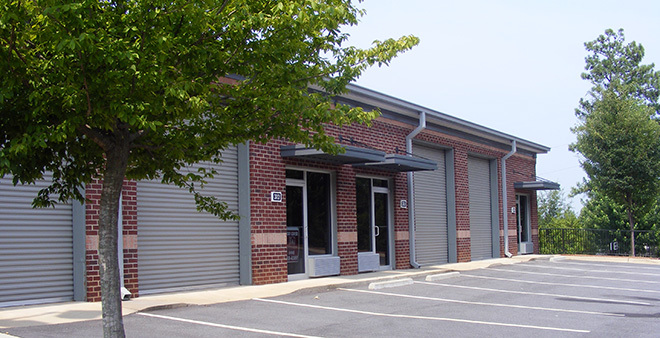 New Businesses – Hembree Center is ideal for new companies requiring small space that can be easily expanded. Professionally Managed – Hembree Center is professionally operated by a firm with over two decades of experience in operating commercial properties throughout Atlanta. Locally Owned & Managed – Property management and ownership decisions are Atlanta based. © 2019 Commercial Property Professionals. All rights reserved.